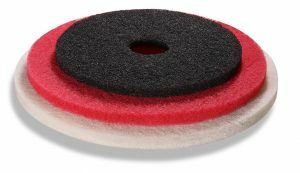 We distribute normal and extra-strong (highly abrasion-resistant) floor scrubbing pads for machine cleaning of various surfaces. We have a wide choice of sizes to ensure we can provide high quality floor pads for your floor cleaning machine. We can also procure floor pads responding to your individual needs (e.g. bonnet, sponge, diamond. We have copious amounts of normal pads on stock to be able to serve you fast: just let us know the diameter and color you need.